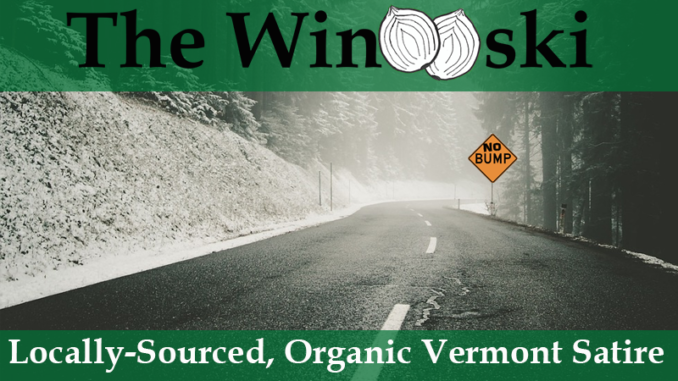 MONTPELIER – After a negotitation breakdown with the governor of New Hampshire, Vermont Governor Phil Scott has come up with a new plan to solve the growing sign shortage crisis. For the past several weeks the state has struggled to procure the necessary signage to label every pothole and bump that almost cover their roads and highways. But under this new plan, all existing “BUMP” signs will be taken down and instead labled “NO BUMP.” These new signs will be placed on sections of street without any potholes. Vermont residents seem to be hopeful about the new plan, with many expressing support online for the new signage. The new signage is expected to be installed over the next two weeks, and VTrans will launch an awareness campaign at that time to alert drivers to watch for the “NO” part of the “NO BUMP” signs. Syrup & Cows #092 – 3/10/19 – Thin Thursday?